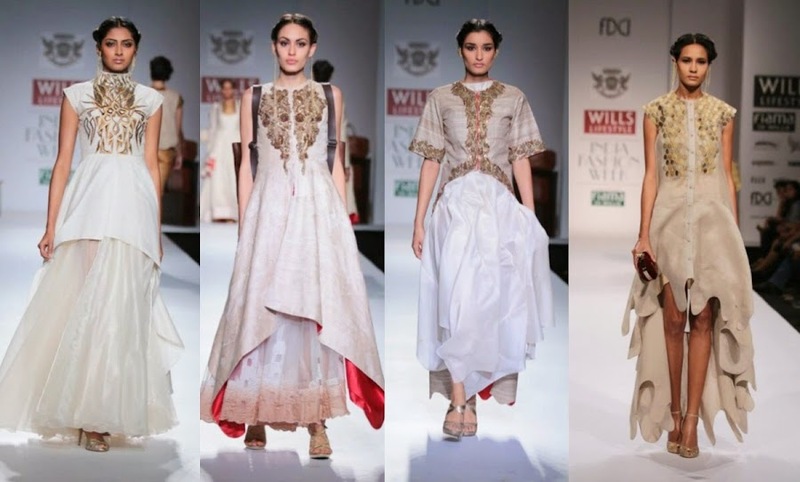 In continuation to last post, where we discussed the Best of WIFW (Wills Lifestyle India Fashion Week AW'14), I couldn't help but add an extension to the term "Best" and map out a few more desired styles/designers and zoom them to focus. There was still so much left for fashion designers, runway collection and everything stylish, which was loved, hence it was necessary to get some more scoop from the runway and put an end to the fashion cravings and launch a part ii series. After all that's what bloggers do right ? Extract the whole juice from the freshest designs from the fashion weeks?? lol ! Well then Here's to a few" MORE" of my favorites . Fashion Designer Mandira Wirk Collection "OMBRE", started off on grey tones along with Burgundy and Amber for the first segment and we saw a switch over to intense purple and charcoal and Black for the final segment ,where Gauhar khan stepped in looking Bold and nothing less than Royality in Black sleek gown. The bodice with fur looked pretty n elegant,n there was a polished mix of colors, sharpened with laser cuts and softened with embroidery. Elegantly styled belted coats and giant floppy lapel was also seen in her collection. The silhouettes were dreamy, and very English.The bags were couturier with an exclusive line of baguette, and minaudieres and bow clutches. Miss India International 2012 Rochelle Maria Rao was also seen walking the ramp for her. 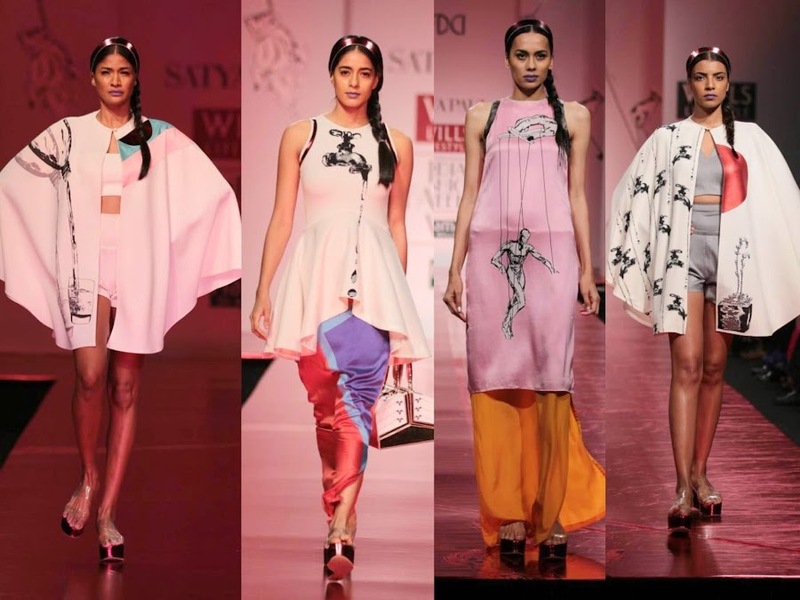 Satya Paul's Fashion Designer Masaba Gupta Collection, set all eyes rolling;no wonder she is the Queen of digital prints, and one can't just stop admiring her work. The collection named "Icarus " had a lightheart take on prints and it explored various paradigms of illusions and its form. Her designs are a visual treat for many, and I have imagined myself about umpteen time wearing her work.A tap of running water, positioned as to drip onto your thighs, just above the slit, a safety pin pulling together the cut, and a lot more prints with strategic placement about where the print would fall seemed so seamless and proved her genius. Besides the designs being attention grabbing, I feel there is a lot of energy moving in her garments. The collection being futuristic, works with a formula of less is more, and even the models were seen abstain from any accessories except the outstanding bags which matched the topography of the prints in focus." Dear Masaba We bow to u :) "
Fashion Designers Pankaj and Nidhi collection, "House of Cards" was based on a Spanish theme, and the ramp looked beyond amazing in the backdrop of giant size cards plastered from ceiling to the floor and Their was a lot of anticipation in what's gonna come next and heart pumping fast. The show started with a matador dance with the torero doing the famous bullfighter's double step. 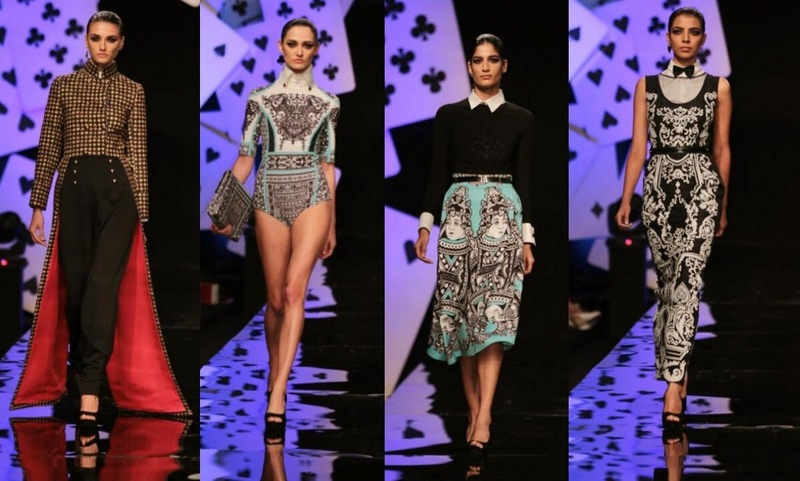 The collection was rich and artistic, with applique work and gold cords and pack of cards inspired prints. The matador capes conveyed the most elemental and exciting powers of fashion and had a convenient flow. Besides that, the collection was suited for both formal and casual dressing. Fashion designer Samant Chauhan Collection, themed RAJPUTANA TRAVELLER, was an unexpected pleasure. The back ground score of the running train kept up with the whole traveler theme. The models strutted down the ramp with rucksack style bags and humongous bagpacks, which made the whole theme sewed in perfectly. The designer sets apart things by using unusual silk yarns, and hand woven fabrics, with intricate gold zari that even mother nature seems to be giving a nod .The models came down wearing soft textured and luxurious pieces with all eyes above the neck when the fancy metallic ear cuffs and ear chains were noticed making a definite statement.At least it made me embrace the trend, and wear one on my lobe the next day.